Well what a season for the Raiders! They came so close to finishing the regular season with a perfect record, if not for the Seahawks (which I will get to later on). The Green Machine flourished this season under new OC Mark Medrano, holding the top of the table with a 100-point difference in points scored, compared to second placed Sydney Uni. 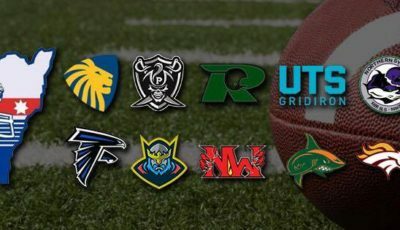 With additions to an already high-powered offense like QB Mitchell Sheppard (UC Davis) and WR Gary Chambers II (Arizona Sun Devils, Buffalo Bills), the Raiders turned it up this year and really put the entire league on notice. This was particularly evident when they knocked over the defending champions Sydney Uni Lions in the Foundation Shovel match in week 9; the first time the Raiders have won the Shovel since 1999. By capturing first place, the Raiders will enjoy a week off (and no doubt scouting their opposition), and will take on the lowest ranked quarter final winner in week 2 of the playoffs. The Lions experienced an interesting start to their season before bouncing back in the latter weeks to capture second place. A new look under centre in ex-Bayside Ravens QB Mitch Tierney brought new beginnings to the defending champions. The Lions experienced their first loss ever to the North Sydney Rebels in week 3, and had the entire league talking. But in typical Lion fashion, they bounced back in week 4 and shut down their long-time rivals the West Sydney Pirates. The Lions then went through the league racking up wins before falling short in the Foundation Shovel match in week 9. A highly contested win in week 12 against the UTS Gators cemented the Lions in second place but not without some changes. It seems that HC Andrew Ogborne is looking at options under centre as he worked out both S/QB Jordan Nikora and QB Lukas Vojnar against the Gators. Will be nice for him to have these options in week 2 of the playoffs as they Lions will face the highest ranked playoff winner. I remember writing about the Gators in previous seasons with some angst, probably because they beat the Predators during the season. But now, I’m a Gator through and through, and what a season it was for us. As the only team that played the least amount of games in the whole GNSW (don’t get me started), the Gators had a slow start to the season. Going into our week 6 clash with the Raiders, we sat at 3W and 1L and it was tough sledding. The fast-paced Raiders offense were just able to edge a win away from the Gators. We were able to pick up a few more wins, particularly a crucial win against the Rebels in week 10. Unfortunately, we fell short of 2ndplace with a week 12 loss to the Lions but this just gives us an extra game to play, with a quarter-final showdown against the Seahawks slated. No offence, but this is a team I didn’t think I would be writing about in the playoff picture for at least a few years. But what a turn around the ‘Stangs have had over the last few seasons. Under veteran coach John Boss, the Wollongong lads have flourished with a big inception of players this season. And with a new look run-heavy playbook, the Mustangs just snuck their way into the playoffs in the final 2 weeks of the season. With a record of 2 wins and 5 losses, the Mustangs took on the fast paced (and pass-heavy) Seahawks in week 10, and piled on 62 points against them. This was capped off by their defence grabbing 3 picks in one quarter alone. But the biggest test came the following week, as they faced off against the West Sydney Pirates who were also fighting for the final playoff spot. A 20-13 win against them and only one more hurdle to clear; the Nepean Ducks. In a game that was dominated by the ‘Stangs strong ground game, the boys in maroon and yellow clinched their first ever playoff berth. 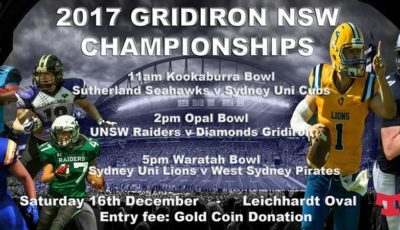 They will now face the North Sydney Rebels in a home quarter-final clash that could prove to be an interesting matchup. With some key losses in the Rebels D, will they be able to stop the run-heavy Mustangs? Stick around to find out. The final team to round out the playoff picture are the lads from the Shire; the Sutherland Seahawks. Coached by GNSW Veteran Christos Lambropoulos, the Seahawks enjured a shaky start to the season. With back to back losses to the Gators and Raiders, the Seahawks entered a huge week 8 clash with the Rebels at 2 wins and 4 losses. Behind QB Daniel Tickner, the Seahawks picked up a huge upset. But the biggest was yet to come. Entering a week 11 matchup with the Raiders, the Seahawks had to win in order to secure a playoff spot. They were coming off a thrashing at the hands of the Mustangs previously and Coach Lambropoulos was determined to not let his team’s season end here. Late in the 4th, a key defensive stop on the goal line set up the ‘Hawks for their final drive. Tickner led his team to not only score a touchdown, but pick up the 2-point conversion. Oh, did I forget to mention that up until this point, the Raiders were undefeated; 10-0?! I think for anyone that was there, there was quite boisterous cheering coming from the Seahawks sidelines (I swear someone would have thought UTS was playing haha) after securing that win. Their win against the Rebels was avenged in week 12 but the post-season was calling. 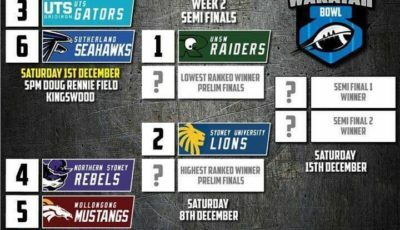 With that, the Seahawks will face the UTS Gators in the first game of the quarter-finals; a week 1 rematch. As the GNSW have touted it, it is a battle of “one of the most feared defenses in the league (still the number 1 D to be exact), versus one of the most dominating passing offenses.” This is one game you DEFINITELY don’t want to miss. Ah, the Ducks. Always a soft spot in my heart. I don’t know if that’s cause they’re all nice blokes or if it’s cause they’re coached by one of the nicest blokes around; Glen Bowes. The Ducks fell short (again!) of the playoffs with a devastating loss to the Mustangs in week 12. But the culmination of all their hard work came in a week 8 clash with their local rivals, the West Sydney Pirates. Every year, the Pirates had dominated the Ducks. But it wasn’t to be in 2018. Behind talisman RB Adam Simpson (who put up over 100 yards on the ground), the Ducks fought tooth and nail (or is it beak and flipper) to seal a 20-19 victory. Big credit to their D, led by LB Jack O’Donnell, who were able to slow down a very strong Pirates O. Their week 9 35-34 loss to the Seahawks would prove to be their downfall as the Seahawks finished higher due to head to head victories. Nevertheless, I feel the Ducks are getting stronger and stronger each year and could definitely be Choc’s pick for dark horse of 2019. EASILY the biggest surprise of 2018 was the performance of the West Sydney Pirates. This is a team that finished second each year for the last 3 years running so their fall from grace was very well documented. After waiting 3 weeks to begin their 2018 campaign, the Pirates came out in usual fashion and dominated the Sharks 50-8. A 35-23 loss to the Lions in week 4 was not a surprise, but the scoreline did not do the Pirates justice. At many points of the game, they held the Lions out and a 80 (maybe 90) yard pick 6 by S/LB/RB/SuperSub John Maumau kept them close. But this loss would unfortunately begin a long spiral down to the mid-lower tier of the GNSW table. A win over the Seahawks kept some hope alive but the Pirates were humbled by the Gators in week 7 in a 33-2 loss; with the only score for the Pirates coming from a muffed snap by the Gators. In my opinion, I think one of the biggest losses for the Pirates was veteran QB David Ward. His intelligence and field presence was second to none and he has left big shoes for Mitch Hunt to fill. I always say Ward is like the Peyton Manning of the GNSW and this is pretty evident. Manning left the Broncos and we went 9 and 7 and finished 8thin the AFC, falling short of the playoffs. I think with a bit of recruiting in the offseason, the Pirates will jump back to being the juggernaut they were last season and re-enter the playoff race in 2019. I don’t think anyone in the GNSW can say they have more heart than the 20-something man roster of the Central Coast Sharks. Suffering key losses in QB Jordan Nikora and TE Eamonn Akamarmoi, it wasn’t known if the Sharks were going to field a team this year. With new HC Adam Hilton at the helm, the gaping hole of GNSW legend Pete Tos was felt. The Sharks were unable to sneak back into the playoffs like they did a few seasons ago but played with nothing but heart; with all 20 or so blokes doubling up on both sides of the ball. With a big question mark hanging over the Newcastle Kings team for 2019, here’s hope that the Sharks are able to recruit heavily in the off-season and Make the Central Coast Great Again! PS – incredible to see that the Sharks Colts program has their first playoff berth in their rookie season, good luck lads! Rounding up the GNSW table for 2018 is the Newcastle Kings. With only 21 players registered in week 1, the Kings folded after week 5 due to lack of numbers. Their biggest loss from the 2017 season was their HUGE O Line. With some of the older lads retiring and some moving on, a lack of numbers forced them to pull out of the remainder of the 2018 season. In a university town, here’s hoping that the Kings are able to recruit and get some numbers for 2019; but if not, I’m sure you’ll see some red helmets lining up in the Sharks orange and green.